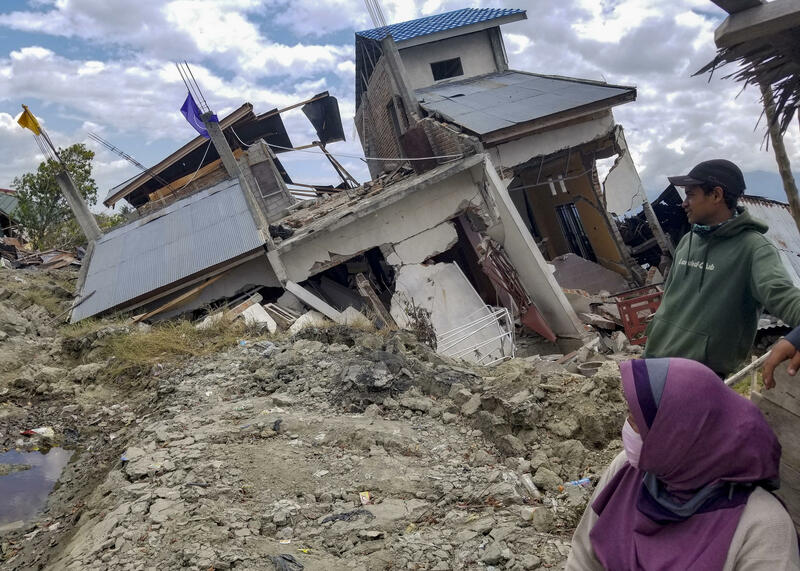 Vera Rahayu Putri and her husband Faizal, who goes by one name, survey earthquake damage in their Palu neighborhood of Petobo, now covered by mudslides. Putri's 9-year-old son, Raldi, is among thousands of children who are unaccounted for. 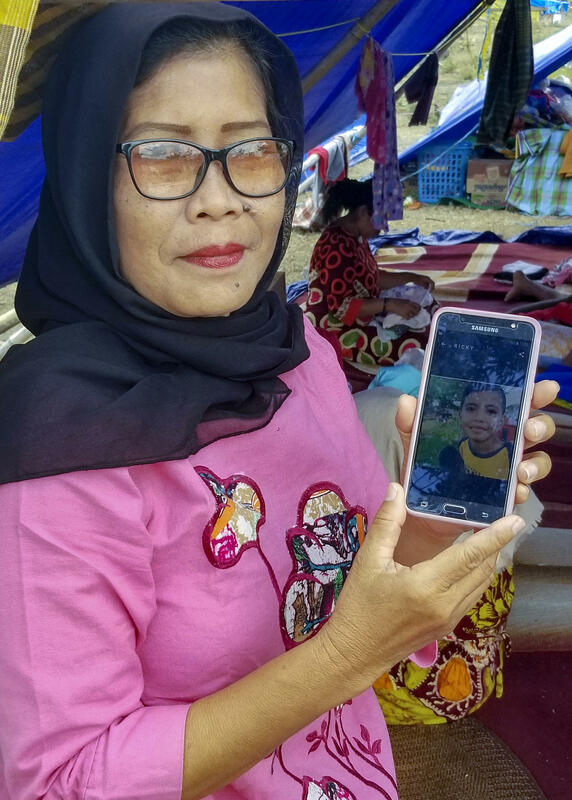 Evi Raharuddin, 54, shows a photo of her 9-year-old grandson, Raldi, who disappeared when the family ran from their house in the earthquake on September 28. 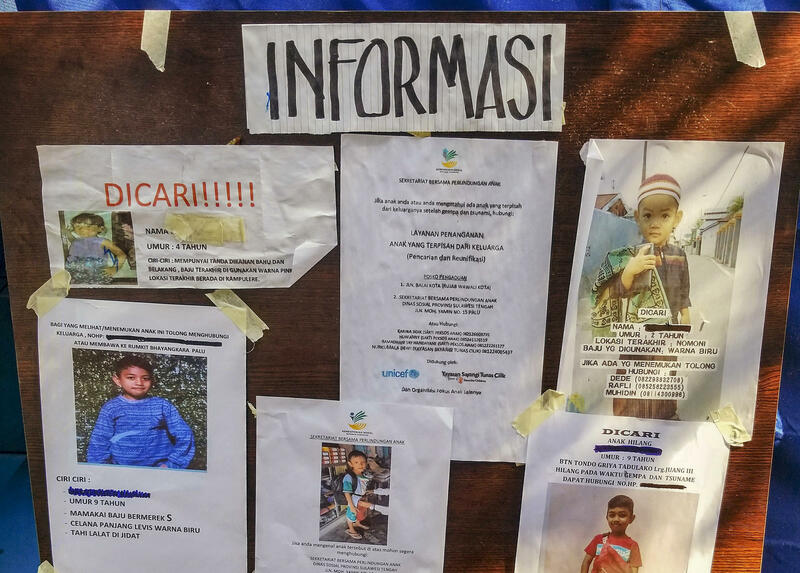 Photos of missing children are displayed on a bulletin board at an encampment in Palu run by Save the Children and UNICEF. 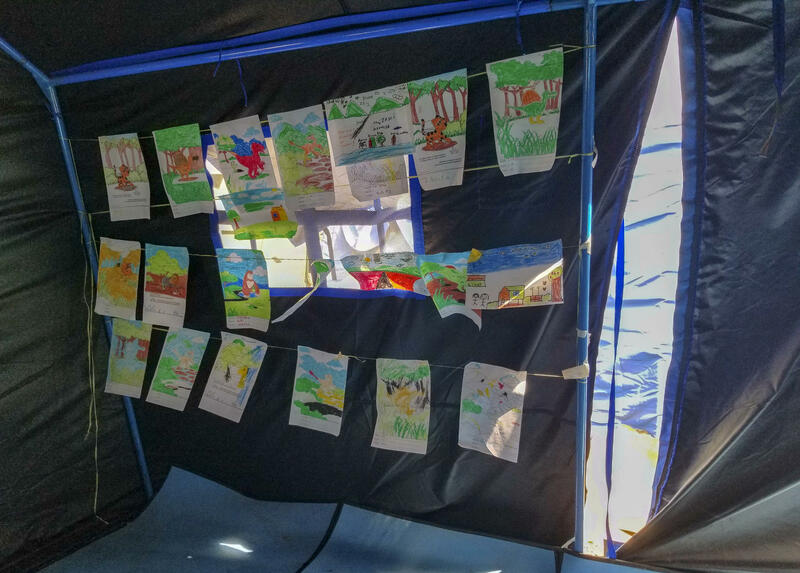 Artwork by children evacuated from the earthquake and tsunami hangs in an encampment run by Save the Children and UNICEF in Palu, Indonesia. Tents cover the lawn of a cracked government building in Palu. Coloring books are spread out across a tarp on the lawn. Children play tag in the driveway and wag their arms and hips in the popular "floss" dance, under the shade of palm trees. This is where they bring children who were separated from their families after the earthquake and tsunami hit central Indonesia last month – as well as kids who were reunited but need trauma counseling. "I'm scanning all the little faces," says Evi Kaharuddin, who's trying to find her 9-year-old grandson, Raldi. He disappeared when the family fled from their house after the earthquake hit. Kaharuddin, 54, describes her grandson as a smart and chatty boy. He just got a new bike. She scrolls through cellphone snapshots of Raldi, a boy with bright eyes. On Friday, the government will call off the search for more bodies, citing safety concerns for recovery workers. But another search is only just beginning, among the living: Parents and children separated in the chaos are trying to locate one another, with the help of charities. The overall number of children still missing is believed to be in the thousands. It's unclear how many are still alive. An unknown number of bodies remain buried beneath neighborhoods where the soil liquefied after the quake. The tents make up one of several aid stations for separated children that humanitarian groups have set up across Palu, the city closest to the earthquake's epicenter. Social workers teach kids a song about not being afraid of earthquakes and then pull them aside one by one, to glean information. "The most difficult is the babies," says Akbar Halim, with UNICEF. "They cannot [answer questions like] what is [your] name? Who is your father? Where do you live?" In tents, hunched over laptops, the advocates index school photos, medical records and lists of those confirmed to be alive or dead. Only now that some roads in Palu are passable, and phone service is being restored, are people able to report their children missing. The case numbers have spiked. "For example, we started with a low number of only three cases a day, but yesterday it jumped to 19 or 20 [missing child reports a day]," says Zubedy Koteng, from Save the Children. Parents must navigate a bureaucracy designed to protect against child trafficking in disasters. Many are unable to provide ID cards and other documentation because their homes have been destroyed. Only a minority of births in Indonesia are registered, and some people tend not to keep birth certificates, Koteng notes. DNA testing is used as a last resort because it's expensive. In the first ten days after the earthquake, UNICEF and Save the Children registered about 100 unaccompanied minors. They've also received reports from families of more than 200 missing children. The Indonesian Red Cross and other groups keep separate tallies. While Kaharuddin searches aid stations for her missing grandson, the rest of Raldi's family is camped out in another tent across town on the edge of their Palu neighborhood, Petobo — which is now almost completely submerged in mud. Raldi's mother, Vera Rahayu Putri, 29, is five months pregnant. She says she sleeps only fitfully and keeps having the same dream, that Raldi hit his head and is trapped somewhere. She clings to a tip from her cousin, who says she heard from someone else that Raldi was spotted getting into a car as the family scattered from their home in the quake. Putri holds out hope that maybe the boy might wander back to their house. It's been 13 days as of Thursday. The only way to get to the family's house now is by motorbike on narrow dirt paths that cut across rice paddies. The asphalt roads in the area have all been wiped out. NPR retraced the family's escape path with Raldi's stepfather and uncles, searching for signs of the boy. But they can't even find their house. Parts of the roof could be spotted nearly a mile away from where the structure once stood, carried away on rolling waves of mud. There's an eerie silence in Petobo now. Former residents step gingerly across plywood boards laid over pools of wet mud. Scavengers haul out scrap metal. The paramedics have come and gone, removing dozens of human remains. But the stench of death is still there, under several feet of wreckage. "Petobo is only a memory now," says Faizal, the missing boy's stepfather, who like many Indonesians goes by one name. Petobo is one of the Palu neighborhoods which Indonesia plans to declare as a mass grave and memorial. Raldi's family says they are not ready for that. His grandmother, Kaharuddin, sleeps at the camp for lost children every night. She's become a surrogate grandmother to the kids. They climb on her lap and tug her sleeves. They remind her of Raldi. "Children are so precious," she says, "and out time together is so fleeting." There are intact families here too, getting counseling for trauma. "Child abuse, child violence, exploitation — they all go up in emergency situations like this," explains UNICEF's Halim. "The parents may not function very well, the community collapses and the social support system also collapses. So children are the most vulnerable group of the population. They cannot survive without support from others." There have been a few reunifications at the station, when parents walk in and spot their missing child — and everyone bursts into tears. There are also more unclaimed children being dropped off. Halim chokes up recounting how a street vendor recently brought in a little boy. His mother had handed off him off as she was swept away by the tsunami. Halim and his colleagues are now trying to find the boy's extended family. Halim, who is based in the capital Jakarta, rushed to Palu immediately after the quake struck and expected to be here days, or maybe weeks. But UNICEF has just extended his stay for at least another three months. He and the other workers might need more time than that. As aid workers trade stories of past successes, they talk about an Indonesian brother and sister who were reunited with one another and their parents ten years after the big 2004 Asian tsunami.